I've got a major new crush in fashion and it happens to be the Betty and Veronica line! If you're familiar with Archie comics, or the hit new show Riverdale (my guilty pleasure at the moment), then you'll recognize Betty and Veronica as the babes and style icons of them both! Before I go any further, do yourself a favor and go watch the show! It's SO good! It has Cole Sprouse in it and that's all I really have to say about that! HA! But really, one of the main reasons I am enamored with this show and the comics is because of the fashion! So, when I got the chance to work with the line inspired by B & V, I just knew I would have loads of fun with it! 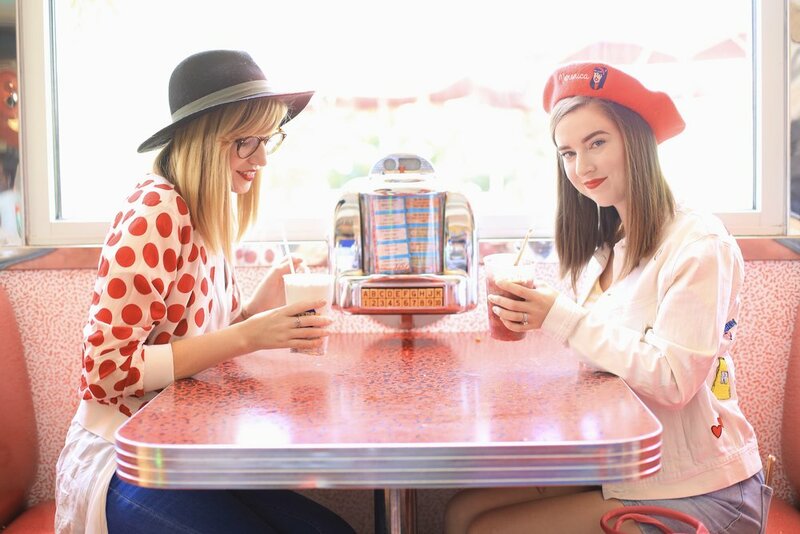 What was so fun about this shoot and putting it together is that from the get-go is that we knew Mel's Diner at Universal Studios Orlando would be the perfect place for it! It's old fashioned, just like Pop's, and had that overall aesthetic that we were looking for! I shot this with my friends Kristyne and Alex and we all repped our best B&V style! Also, holla at yo girl because I am now a Universal Annual Pass Holder! Bring on all the Universal fun! I can't thank Alex enough for taking all these photos! She is such a blooming talent, so definitely be sure to follow her photography account too to keep up with her creative mind! When it came to putting together all our outfits, we really wanted to each bring something different to the table. We are all three so different but that's what made this so FUN! The Betty and Veronica line is filled with quirky, colorful, subtle, and not-so-subtle pieces, so it was a blast seeing how each of us made our own personal style shine! I think that really speaks volumes to the line itself too that 3 different girls were able to create outfits we all loved! I was all heart eyes for my denim patch jacket which the total star of my outfit! The denim itself was so soft and I loved looking at all the colorful patches on the back! Then I just threw on this cute Veronica beret (V is my FAVE), and felt like I had popped right out of the comics! Between sippin' on shakes, chatting, and just having some photo fun, it was one of the best days I've had in a while! Can't thank these girls enough for that! I have a few more ideas for items from this line and I can't wait to share them with you all!